The Sujihiki slicer is perfect for fabricating large roasts to thinly slicing cucumbers or smoked salmon. Yoshihiro Sujihiki slicing knives are perfect for table side carving during holidays and special occasions. Our Yoshihiro Inox Sujihiki slicing knife is forged with a combination of the traditional styles of Japanese and Western slicing knives, with a long straight blade that smoothly slices through meat or vegetables and preserves the integrity of each ingredients freshness. Our Yoshihiro Inox Sujihiki is forged from a single piece of Aus-10 stainless steel and is complimented with a premium Western style high-grade composite wood handle that extends to the full tang of the knife. It is NSF certified for use in commercial kitchens. With a carbon content of over 1%, the Yoshihiro Inox Stain-Resistant Aus-10 steel knives outclasses most other competitors in edge retention, toughness, and ease of sharpening. 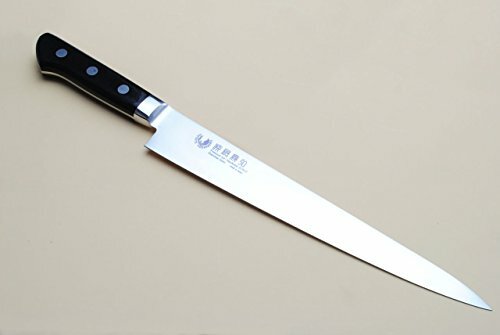 This fact makes the Yoshihiro Inox Aus-10 Series the top of its class in high-end stainless steel knives. Japanese knives should always be sharpened and honed on premium quality Japanese water stones. For maintenance info and professional Japanese knife sharpening contact our Yoshihiro Cutlery store.Yoshihiro knives come with a limited lifetime warranty. Sujihiki Slicer Chefs Knife is perfect for fabricating large roasts to thinly slicing cucumbers or smoked salmon. Best in class in edge retention, toughness, and ease of sharpening. Can be resharpened to reacquire its original sharpness for years on end. Stainless steel bolster, full tang, and a high grade composite wood makes for a strong and durable knife that is beautiful, balanced, and comfortable. Handwash with mild cleanser; NSF Approved; Handmade by skilled tradesmen in Japan.